↑ 1.0 1.1 "C-GIDD (Canback Global Income Distribution Database)". Canback Dangel. Retrieved 2008-08-20. This is a list of administrators and governors of Ekiti State. 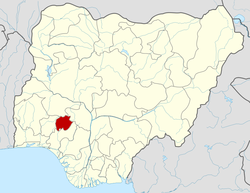 Ekiti State was created on October 1, 1996 from territory of Ondo State. Àtunṣe ojúewé yi gbẹ̀yìn wáyé ni ọjọ́ 12 Oṣù Kínní 2016, ni ago 00:14.